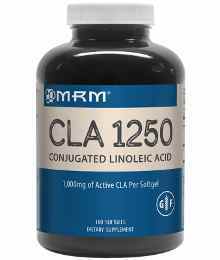 MRM CLA High Potency Conjugated Linoleic Acid (CLA) contains 1000mg of active CLA per softgel. CLA is a naturally occurring free fatty acid found mainly in meat and dairy products, in small amounts. But getting enough CLA from your diet for the preferred benefit would require considerable intake of food. This is not only impractical, but would also have a seriously negative impact on your metabolism due to the high caloric penalty you would pay. The most economical and efficient way to get the required CLA is by using MRM’s softgels which contain CLA derived from Safflower Seed Oil. This allows for precise CLA intake at determined time intervals throughout the day without the high calorie food consumption. Make MRM’s high potency CLA part of your healthy lifestyle of regular exercise and a balanced diet to help achieve your goals. Ingredients: Other Ingredients: Gelatin (softgel), Glycerin. Manufacturer’s Directions Take 1-2 soft gels 3 times daily with meal, or as directed by your healthcare provider. MRM produces a variety of sports & wellness supplements. Our scientific expertise, superior ingredients, and ability to stay at the forefront of market trends & consumer needs have given us a distinct competitive advantage over other manufacturers.